Hiltgunt Zassenhaus was 17 when she first resisted the Third Reich by refusing to give the “Heil Hitler” salute in her high school. Later, as the terrible events of wartime Germany swirled around her, she risked death to smuggle food, medicine, and emotional support to hundreds of political prisoners, ultimately saving them from mass execution by the Nazis. 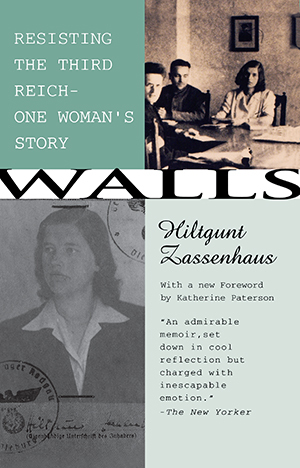 Walls is her story. For her wartime work, Zassenhaus was nominated for the Nobel Peace Prize in 1974. Walls was named on of the 25 best books of 1974 for young adults by the American Library Association and received a Christopher Award in 1975.